Christmas season is just around the corner and all over Switzerland the streets are full of Christmas lights and decorations. There are certain aspects of Christmas that are pretty universal, e.g. the gifts, the tree and the lights. Yet, every country and region developed it's own style of celebrating this holiday and Switzerland is no exception. However, customs and traditions don't stop at official borders so it is very likely that our nearest neighbors have very similar Christmas traditions! If you happen to be in Switzerland during the Christmas season or if you live here, you should take advantage of it and delve into some fun Swiss Christmas activities. If you don't know where to start, here is my list of Swiss Christmas Traditions. 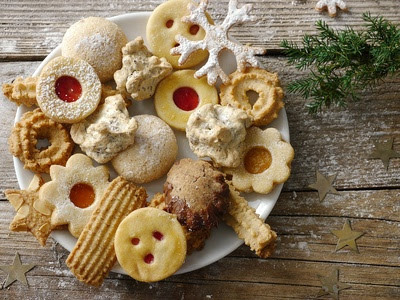 Cookie Baking: Yes, almost every Swiss family will bake several batches of Christmas Cookies. There are so many different kinds: Zimtsterne, Chräbbeli, Mailänderli, Brunsli and more! We bake them and love to give away neatly arranged and filled cookie boxes or bags. So good! Poems for Santa: Santa visits Switzerland on December 6th and it is custom for children to recite short Christmas poems for him. He then gives them mandarines and peanuts! Christmas Calendar: Either a store bought or home made Christmas Calendar can be seen in most Swiss homes during the holiday season. It's a fun way to count down the days until Christmas Eve! Advent Windows: Much like Christmas Calendars, Advent Windows count down the days to Christmas Eve. Only, that they are real windows that families all over the village decorate! Räbeliechtli: In the end of November you can see small parades of beetroot lanterns all over Switzerland. Children carve them at school with their teachers and parents and will walk them singing through the villages. It's really nice to be reminded of the Christmas traditions here. Having lived in Geneva for over 18 years,which for many is not really Swiss, there are still signs of these Christmas traditions. For instance a friend of mine who is married to a Swiss German gave me an empty biscuit tin in early December. Little does she know that I am not a baker, so regrettably the tin is still empty. Being Jamaican however I continue to associate Christmas with my favorite meals back home and wrote a short blog about the cuisine - http://www.experiencejamaique.com/it's-christmas. Yes, every country has their own Christmas traditions and foods. I'm sure Jamaican Christmas is quite different from a Swiss Christmas. I hope you get to enjoy both!